Do your marketing efforts make a difference? Prove it. Analyze the effectiveness of current marketing efforts and implement a long-term measurement discipline through alternative measurement methods. A Marketer's Guide to Measuring Results: Prove the Impact of New Media and Traditional Healthcare Marketing Efforts provides all the tools you need to confidently measure healthcare marketing results. An easy, five-step system for measuring the results of your marketing activities. A long-term marketing measurement discipline that will give you the ammunition you need to defend and even increase your budget. Case studies from five health systems who successfully measure their marketing efforts. Chapter 1: Are You Ready for Marketing Measurement? The Inevitable Question: How Do You Know? Marketing, advertising and PR directors, VPs, and professionals, chief marketing officers, advertising and PR agencies and consultants. 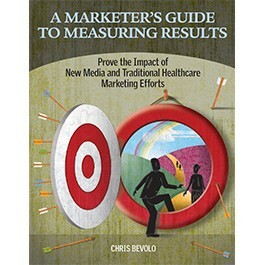 Chris Bevolo is founding partner and president of Interval, a healthcare marketing firm in Minnesota. For nearly 20 years he has led the development of brand strategies and campaigns, patient experience strategies, and marketing campaigns for healthcare clients. He is the author of A Marketer’s Guide to Brand Strategy: Advanced techniques for healthcare organizations, published by HealthLeaders Media, as well as numerous articles and white papers.